Joensuu is a city and municipality in North Karelia in the province of Eastern Finland. 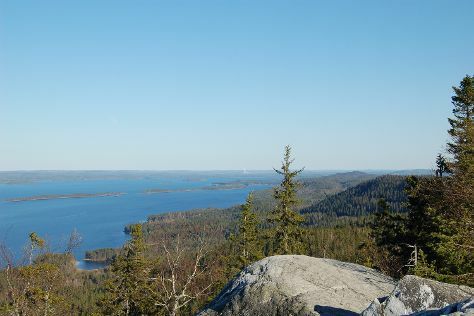 Step out of the city life by going to Ukko-Koli Hill and Linnansaari National Park. Take a break from Joensuu with a short trip to Pielinen in Koli National Park, about 1h 15 min away. And it doesn't end there: wander the streets of Joensuun Tori (Joensuu Market), take in nature's colorful creations at Botania - Botanical Garden and Tropical Butterfly Garden, make a trip to Sculpture Susi Kosiomatkalla, and stop by Kauppakeskus Iso Myy. To find more things to do, ratings, traveler tips, and tourist information, read Joensuu road trip app . In March, daytime highs in Joensuu are 0°C, while nighttime lows are -8°C. Finish up your sightseeing early on the 31st (Sun) so you can travel back home.